Note: Not suitable for J160-C and LSA-55 type aircraft. Correct propeller selection, installation and maintenance is extremely important for Jabiru engines. Because of this, we recommend only using propellers approved by Jabiru Aircraft Australia. Note: Installations which provide some allowance for the expansion and contraction of the propeller wood (such as stacks of spring washers) are strongly recommended. 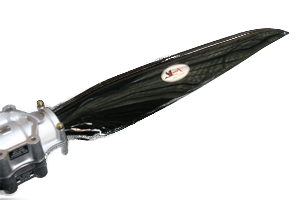 In addition, all propellers require regular maintenance to maintain the installation in safe condition. Jabiru use an Australian Hoop pine laminate, three laminates for the 4 cylinder engines & four laminates for the 6 cylinder engines. The blank is then carved out and hand sanded to the appropriate pitch that is required. 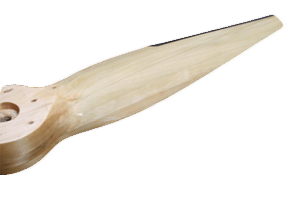 With a layer of fiberglass on each side of the propeller which stops any flexing and gives strength to the timber. A Flexane leading edge which is a hard rubber, is moulded into the leading edge and is a great stone and rain protector. 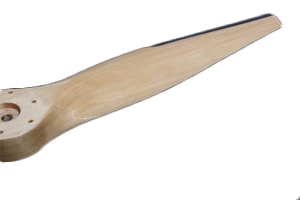 The Jabiru wooden propeller complies with CS-22 Subpart J.
Jabiru have also released a composite scimitar blade prop made from black fibreglass. The blades are injected moulded and are mounted in a forged aluminium hub. 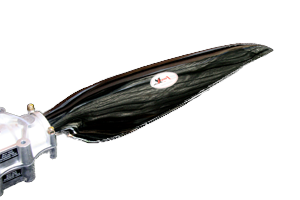 The Jabiru composite propeller complies with ASTM F2506. Protect your propeller with a cover. Propeller cover fits both wooden and composite propellers.